Hall of the Mountain King: Still Spinning: Scatterbrain, "Here Comes Trouble"
Still Spinning: Scatterbrain, "Here Comes Trouble"
What do thrash, Cheech and Chong, Mozart and some of the greatest riffs in hard rock history have in common? This sadly forgotten gem of an album. Scatterbrain arose from the ashes of singer Tommy Christ and guitarist Glen Cummings’ previous outfit Ludichrist with a more thrash feel and a bigger focus on humor. Yes, Here Comes Trouble is something of a novelty album, but the comedy is delivered over some pretty solid chops throughout. If anyone remembers a song from this record, it’s likely the single and video “Don’t Call Me Dude,” a goofy but hilarious tune about a guy who snaps when his girlfriend leaves him for a burly lifeguard on the beach. The song goes through several movements, and the video follows, with the band mimicking various eras of rock ‘n’ roll from doo-wop to 1980s glam. It’s all a lot of fun, but like most of the rest of the album, the underpinnings of the song are very solid thrash licks. In a musical genre that was, most of the time, very grim and serious, Scatterbrain said it was OK to have a good time, and they did. The best evidence of that on this album might be their cover of Cheech and Chong’s “Earache My Eye.” They play it to the hilt, with Christ just having a blast with the vocals. They back up their chops with a metal version of Mozart’s “Sonata No. 3.” In their live shows, Scatterbrain was often known to play medleys of Mozart … or Motorhead … or both together. They pay tribute to some rock greats on “Down with the Ship (Slight Return).” The latter is a reworking of a song that appeared on a Ludichrist record. It opens, naturally, with the main riff from Jimi Hendrix’s “Voodoo Child (Slight Return),” from there we get some more fun and goofy verses, with a memorable moment from a classic rock or metal song played after every line of every verse. You’ll hear snippets of Led Zeppelin, Metallica, The Doors, Aerosmith, Van Halen, ZZ Top, Billy Squier, Yes, and even Phil Collins. One of the fun things with this song when I was younger was seeing how many of those tunes we could name. Of course, there’s plenty of original material, too. Juvenile humor is in steady supply, as on “Mr. Johnson and the Juice Crew,” which starts out thrashing and then transforms into a swinging and grooving hard rocker. And, yeah, lyrically it’s about pretty much what you think it’s about. Along similar lines is “I’m With Stupid,” a song about a guy who gets a little karmic justice for making fun of others. The funkier side of the band comes out on “That’s That,” which reminds me of some of Suicidal Tendencies' more grooving material. The funk part remains one of the better elements of Scatterbrain’s sound. The band could take on some serious subjects, too, though they tended to veer away from it. “Outta Time,” despite it’s upbeat sound, was a pretty dark song about drug addiction and its aftermath. Though couched in humor, “Goodbye Freedom, Hello Mom” makes a few good points about censorship and the people who want to control what others say, do and think. I still love the line “1984 has passed, forget about Big Brother, welcome to the ’90s where the government’s your mother.” We’re well out of the 1990s now, but the sentiment is still pretty accurate. The album ends, where else, but with “Drunken Milkman,” a spoken word “poetry” piece over bongos and sparsely strummed guitar about the unfortunate results of a drunk-driving delivery man. Though panned by most “serious” metal fans who didn’t think that humor and fun had any place in their music, Here Comes Trouble is actually a really good record from a musical standpoint, and it’s a shame that a certain segment of fans weren’t able to look past the goofiness factor to get to that. Scatterbrain would put out two more records before disbanding, both very disappointing when compared to this one. They even tried to revive “Down with the Ship” with new licks on the final one in a last-ditch effort to make something happen. But it wasn’t to be, and in honesty, those records don’t deserve the attention this one does. The band reunited for a one-off show in their hometown of New York City in 2007, but the reunion produced no talk of a more permanent reunion or new music. 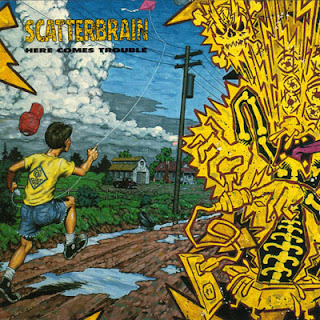 Scatterbrain remains a mostly forgotten footnote in the metal world, and in many ways, rightfully so. 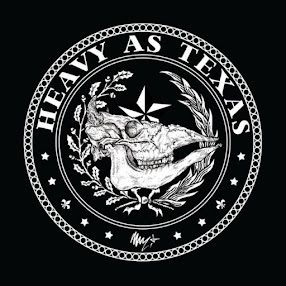 But this album deserves a little more of a spotlight in thrash history. It showed that thrash didn’t have to be serious, dark or politically charged, that you could actually have some goofy, juvenile fun while making a pretty damned good record.